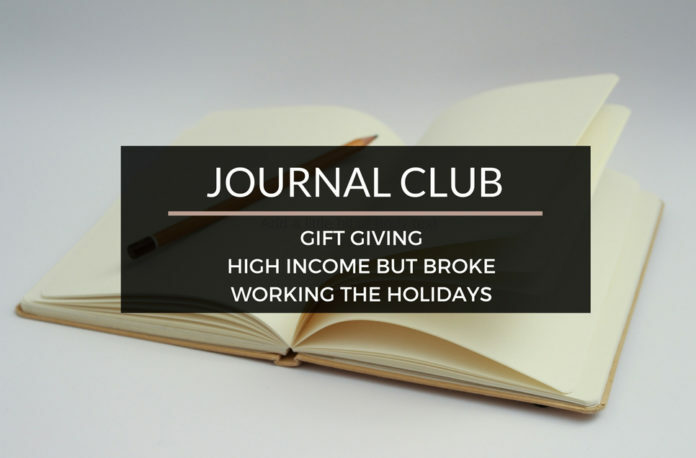 Journal Club 12-24-16 | Passive Income M.D. Ah, the season of giving is upon us. It’s Christmas Eve, what did you get your loved ones? I spent a lot of time researching and I’m glad I came across articles like this one to keep things in perspective. Check out this post by Centsibly Rich, Give the Best Gift They Will Never Forget. Along a similar theme, Physician on Fire hits the nail on the head. You have to read What To Give Those Who Have Everything. This next article reminded me of my previous post, Why Many Doctors Live Paycheck to Paycheck. I talked about a physician making $250,000 having issues getting ahead. Senior Resident ups the ante in his post, How To Make $400k/year and Still Be “Broke. I work a good number of holidays throughout the year. I take it as a part of the job I signed up for, but I can’t say I’m happy to do it. Of course, I’d rather be home, but it was nice to hear from Life of a Med Student and his take on it in How I Learned to Enjoy Working Holiday Shifts. I’m thankful for another holiday season I get to share with my family. Hope you enjoy yours. Have a great holidays everyone! Anjali Jariwala is a CPA and CFP® with a decade of success in tax consulting and financial planning. She founded FIT Advisors to combine these two skill sets and elucidate tax implications during financial planning. Frustrated by the way many financial planners push products with hidden fees and commissions, Anjali decided to exclusively use evidence-based investment strategies and a transparent fee-only structure to eliminate any conflicts of interests. She utilizes the most powerful tools in the industry to save clients time with the option to have virtual meetings. In recent years, Anjali has developed expertise in meeting physicians’ needs by addressing issues for her husband and their many friends & family in medicine. Today, she specializes in serving physicians and business owners. Anjali takes a holistic approach as a financial life planner, helping clients discover their goals and build a secure future.